Sheath theme from Pootermobile - 50 copies to be won! Sheath is a new theme from Pootermobile. It features a completely customizable dock that is vertically placed on the homescreen. The icons on this dock are displayed as text. You can place 11 of your favorite apps here for your keyboard device, and 15 for your touchscreen device. This definitely makes this theme one of the most functional homescreen experiences out there, and you rarely have to leave it. Sheath also features a big clock, transitions throughout, and is very wallpaper friendly. 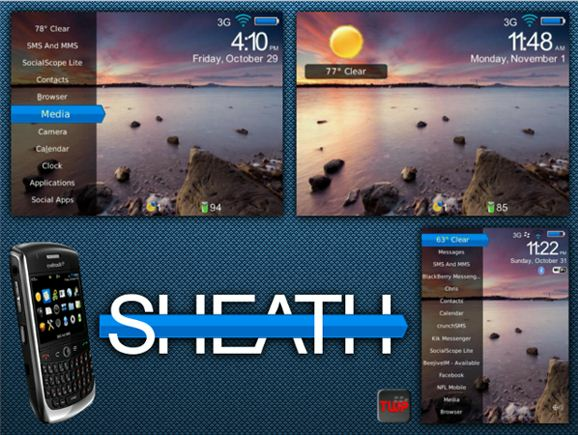 Overall, Sheath is a very high quality theme that brings a totally custom look to your BlackBerry device. You can pick it up for $3.99 at the CrackBerry App Store. It is compatible with the 8900, 9000, 96xx, 95xx, 9700, and 9800. Contest: We have 50 copies of Sheath to give away. Just leave a comment on this post to enter. Contest ends this Sunday at Midnight PST. Please only leave one comment, multiple entries wont count.